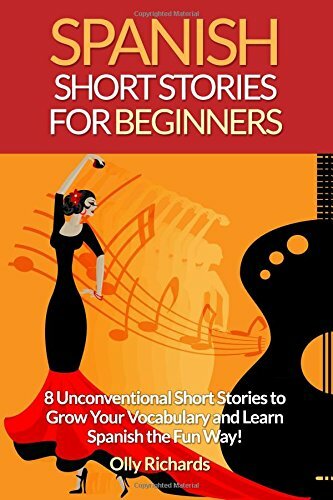 Olly Richards Spanish Short Stories For Beginners: 8 Unconventional Short Stories to Grow Your Vocabulary and Learn Spanish the Fun Way! Improve your comprehension, grow your vocabulary and ignite your imagination with these eight unconventional Spanish short stories! Short stories from a variety of compelling genres, from science fiction and crime to history and thriller, so you’ll have great fun reading, whilst learning a wide range of new vocabulary! Stories broken down into manageable chapters, so you always make progress with the story and feel a sense of achievement without great difficulty reading! Carefully-written Spanish using straightforward grammar that is comprehensible for beginner and intermediate level learners. You'll enjoy reading and learn new grammatical structures without any feelings of overwhelm and frustration. A five-step plan for reading the stories in this book the smart way. These step-by-step instructions show you exactly how to make the most out of the book and maximise your learning! If you’re learning Spanish and enjoy reading, this is the book you need to rekindle your passion for the language and take your Spanish to the next level! So what are you waiting for? Scroll up and grab your copy now! 1. Spanish Short Stories For Beginners: 8 Unconventional Short Stories to Grow Your Vocabulary and Learn Spanish the Fun Way!